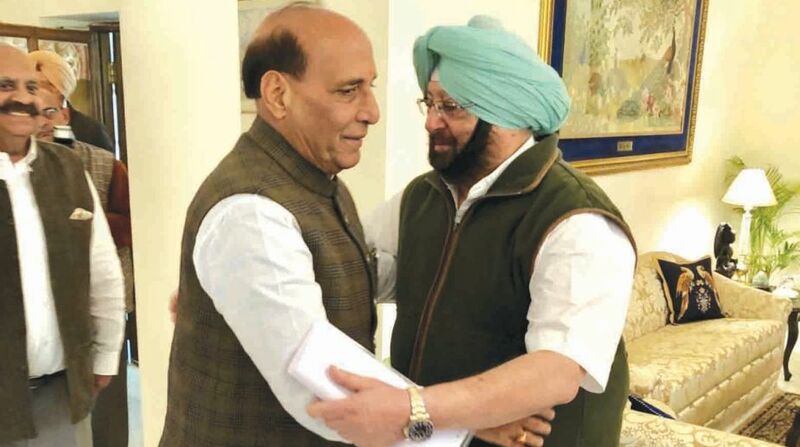 Union Home Minister Rajnath Singh on Tuesday congratulated Punjab Chief Minister Amarinder Singh for his government’s success against gangsters and criminals in the state, particularly the recent gunning down of wanted gangster Vicky Gounder in an encounter. An official spokesperson said Rajnath Singh extended his appreciation during a luncheon meeting with Punjab Governor VP Singh Badnore and Amarinder Singh in New Delhi on Tuesday. The meeting focused on matters related to internal security, with a focus on cooperation between the Centre and the state to maintain peace and stability in the region. “The home minister lauded the efforts of the Punjab police and intelligence agencies in cracking down on criminals and organised gangs and offered all support of the Central government in the endeavour,” the spokesperson said after the meeting. Underlining the need for modernisation of the state police force, the CM sought from Rajnath a Rs 50 crore grant. He reiterated his earlier request for two companies of the Central Reserve Police Force (CRPF) to replace Indian Reserve Battalion (IRB) in Punjab’s prisons, where, the CM said, his government has already initiated sweeping reforms. Amarinder stressed that as a sensitive border state, Punjab needed a high level of security, with a modern police force and fool-proof security in jails.